A Cancun honeymoon simply has it all. From spa treatments to zip lines, there just isn’t a dull moment. 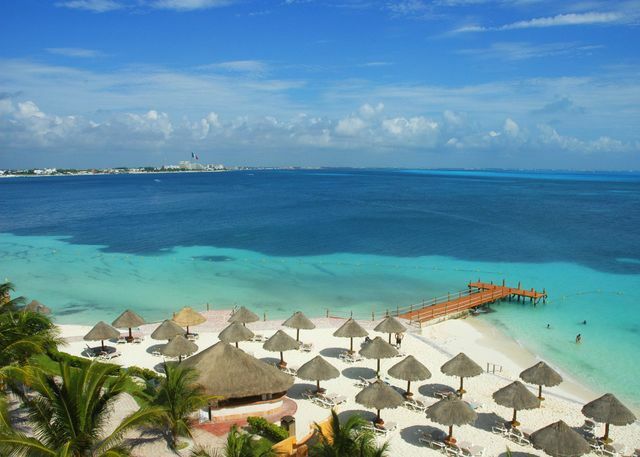 Cancun sits at the very top of the Riviera Maya, the busiest of Mexican beach destinations. Couples who choose to enjoy a Cancun honeymoon need not to worry about having fun. Famous for its gorgeous turquoise water and powdery white sand beaches, the variety of water sports to choose from is overwhelming. The tourism hot spot ‘zona hotelera’ is a twenty two kilometer long sandy strip teeming with all-inclusive resorts and international fare ranging from sushi to Tex-Mex. Authentic Mexican cuisine can be more easily found in El Centro, five kilometers away on the mainland. The nightlife scene is buzzing with clubs and bars that feature live music and acrobatic dance performances. For couples that like to venture out and explore the land, theme parks, archeological sites and lazy beach side towns await. The entire coast is strewn with cenotes — fresh water flooded caves connected by a massive underground network. Whether you're looking for adventure or relaxation, a Cancun honeymoon will suit your style. The sunny and fresh high season starts mid-December and ends around April. American spring breakers run rampant in March, so this might not be the best time of year for a Cancun honeymoon (or a Mexico honeymoon in general!). Summers are hot and humid and the rainy season runs from May to October. The potential for hurricanes is in autumn. Isla Contoy: Spend the day on this uninhabited nature preserve island and turtle nesting area. MUSA: An underwater man made museum for scuba divers and snorkelers to explore. Lobster dinner cruise: The proper way to explore the lagoon that borders the zona ‘hotelera’. Coco Bongo: Musical tributes, high definition visual effects and acrobats keep the party going daily. Couples massage and spa treatments: Choose from the many available options for a relaxing afternoon during your Cancun honeymoon. Cirque du Soleil: World famous acrobatic circus show featured year round. Cenotes: Snorkel or scuba dive one of these impressive flooded caves nestled in the jungle—a truly once-in-a-lifetime Cancun honeymoon experience. Ferry to Isla Mujeres: The ancient Mayans once worshipped the fertility goddess Ixchel here. Day trip to Chitchen Itza: Network of Mayan ruins featuring a massive pyramid. Playa del Carmen: Soak up the sun and do some shopping on beautiful ‘Avenida Quinta’. Tulum Oceanfront: Mayan ruins and a laid back beach vibe a two hours’ drive south.